Clara Patterson’s photograph of children playing a game in Ballymiscaw, County Down, c.1894. Patterson was encouraged by Alfred Cort Haddon to document folk customs in Ireland. 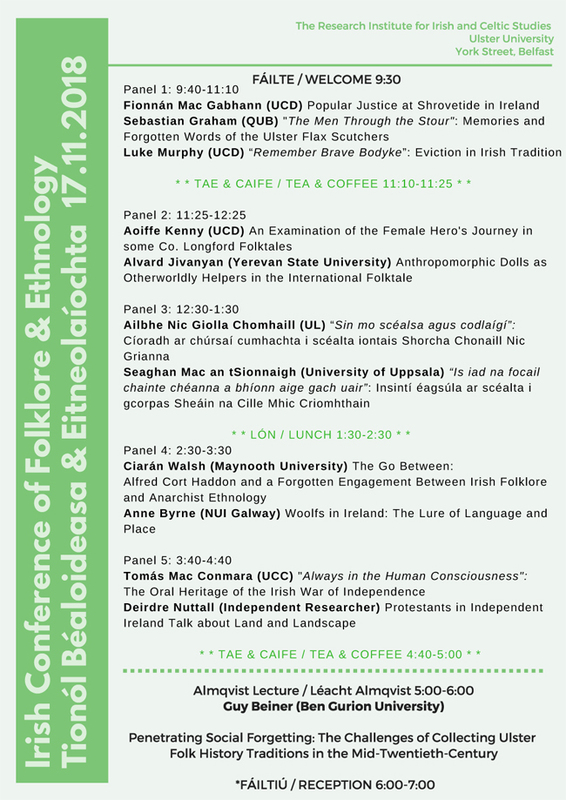 Ciarán Walsh will be taking part in a conference on the relation between folklore and nationalism. Folklore and the Nation is timed to coincide with the exit of the UK from the EU. 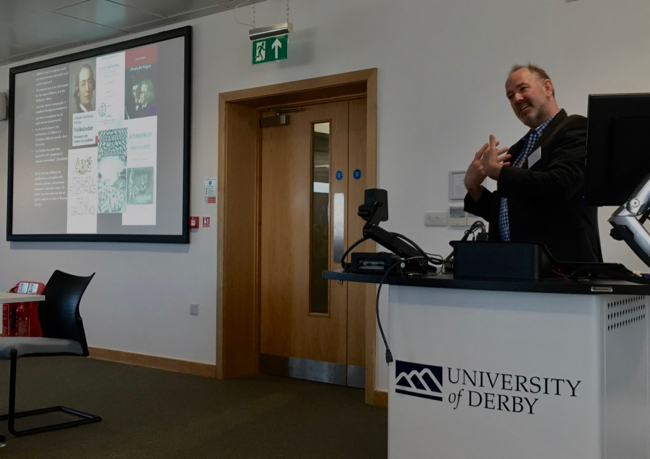 It’s being organised by the Folklore Society (FLS) and hosted by the University of Derby. It kicks off on the afternoon of Friday 29 March 2019. His paper deals with ethnicity, nationalism and folklore, drawing on a forgotten anti-imperial movement in British folklore. 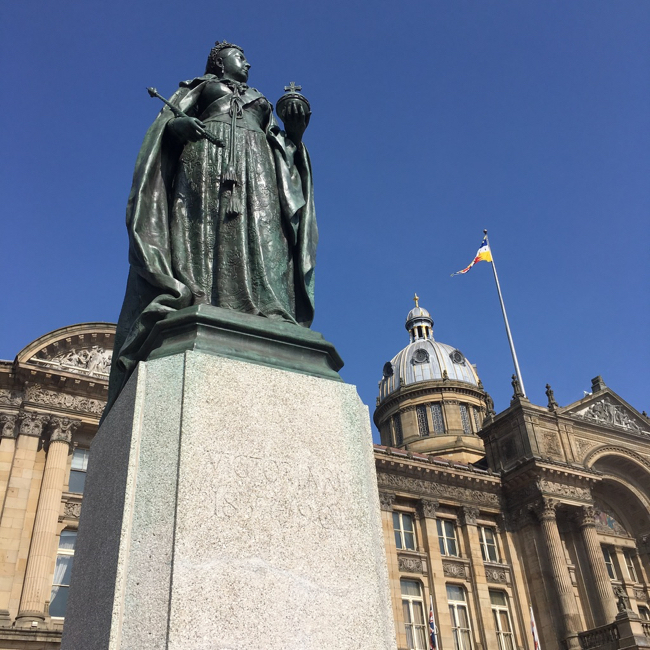 It begins with an anti-colonial speech delivered by Alfred Haddon in Ipswich in 1895. Haddon was aligned with the volkskunde wing of the folklore movement in Ireland and opened his speech by acknowledging nationalist efforts to disengage from political and economic union with Britain. Haddon entered anthropology through folklore, equating the destruction of native customs in subjugated territories with the loss of personal identity, ethnicity, and, ultimately, nationhood. Haddon spoke to Patrick Geddes and Havelock Ellis about reconstituting anthropology as a vehicle for radical anti-colonial activism. They were inspired by the anarchist geography of Kropotkin, the radical ethnology of Reclus, and the “Zeitgeist” of Gomme (FLS). This conference looks like the place to remember an engagement between Irish nationalists, English folklorists and stateless anarchists /ethnologists on the brink of Ireland’s exit from Britain. Alfred Cort Haddon and a forgotten engagement between Irish Folklore and Anarchist Ethnology. Ciarán Walsh, Maynooth University in partnership with the Irish Research Council, TCD School of Medicine, and Shanahan Research Centre. This is a short clip – in GIF format– of a minute or so of footage that was shot in the Torres Strait in 1898, three years after the invention of the cine camera. Liz McNiven, writing for the National Film and Sound Archive of Australia’s (NFSA) Australian Screen website, attributes it to Alfred Cort Haddon and explains that it is a performance the Malu-Bomai ceremony that was performed by men in the eastern Torres Straits. This is a photograph taken by Clara Patterson. 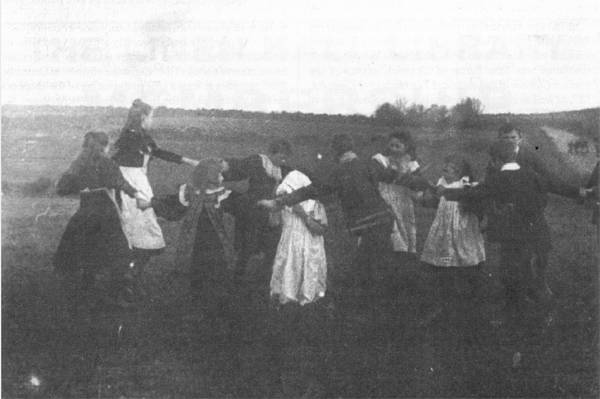 It shows a group of schoolchildren playing “Poor Mary” in the townland of Ballymiscaw in County Down. The photograph is one of a series that was shown at a meeting of the Belfast Naturalists’ Field Club in November 1893. 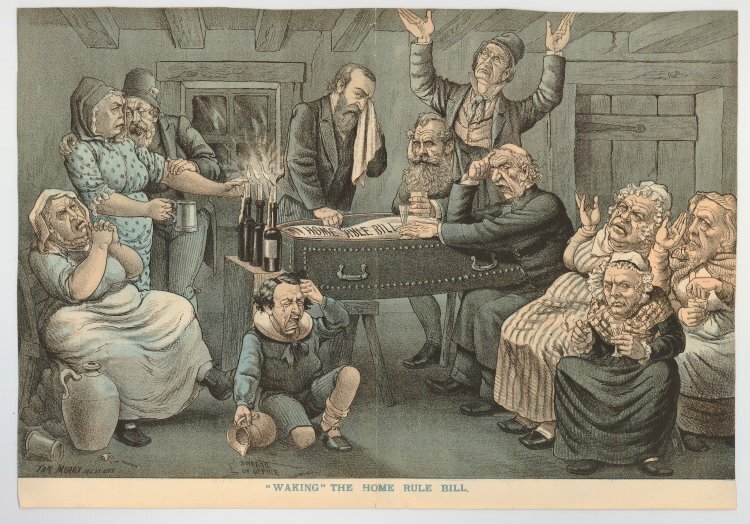 J. R. R. Adams identified the game as “Poor Mary” in The Linen Hall Review [Vol. 10, No. 3 (Winter, 1993)] and described a variation of it in Ulster Folklife [Vol 37, 1991]. What is the connection between these images? If I was to say Pyotr Kropotkin, the Russian geographer and anarchist, it might seem a bit farfetched. However, there is hard evidence to support a claim that anarchist ideas influenced Clara Patterson’s contribution to the first meetings of organised folklore collection in Ulster. That begs another question. How likely is it that Clara Patterson had met Kropotkin? 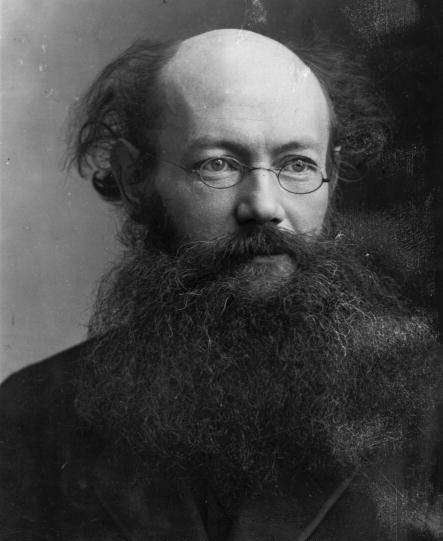 Pyotr Kropotkin (1841-1921), the anarchist prince and Russian exile in London. Unlikely, but the influence of Kropotkin can be explained by looking at another connection, that between Haddon and Patterson. The footage of the Torres Strait islanders establishes Haddon as a pioneer of visual ethnography and illustrates his relentless advocacy of photography as a superior form of ethnographic representation. Clara Patterson’s photograph of “Poor Mary” anticipates Haddon’s film of the Malu-Bomai ceremony by 5 years. This is not accidental. Clara Patterson studied zoology and learned fieldcraft under Haddon in Belfast in 1892. She would have been aware of the photographs he had taken in the Torres Strait in 1888 and 1889 and similar photographs of folklife that were taken in the Aran Islands one year later. Haddon had read Kropotkin in 1890 and adopted Kropotkin’s proposition that the study of social organisation and customary practice proceeds from the simple to the complex. Patterson repeated the proposition in her presentation to the field club in 1893. Haddon, clearly, acted as go-between for Patterson and Kropotkin and, as such, between anarchist geography and folklore collection in Ulster. 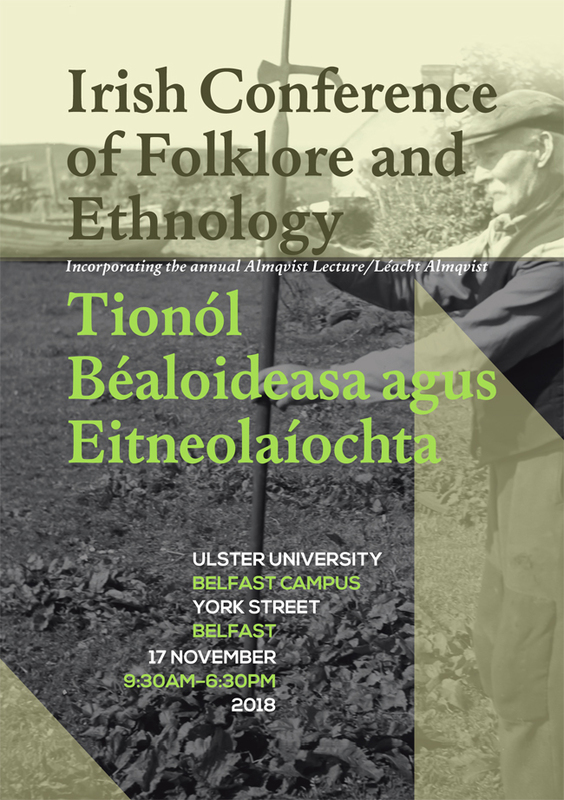 That is the main claim of a paper I will be presenting at the Irish Conference of Folklore and Ethnology in Belfast on November 17, 2018. The paper takes as its starting point an entry in Haddon’s “little black book,” a notebook containing the names and addresses of his network of contacts in the 1890s. 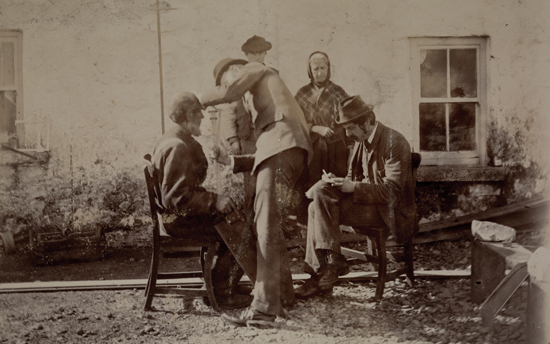 Measuring heads in the Aran Islands, Charles R. Browne and Alfred Cort Haddon in action in September, 1892. Photo: Courtesy of the Board of Trinity College Dublin. Douglas Hyde was listed and the question has to be asked: Why would the person who gave a speech “On the Need for the de-Anglicisation of the Irish Nation” in 1892 be listed among the contacts of an “Anglo-Saxon” who measured the skulls of “Celts” in the Aran Islands, also in 1892? The next question, then, is what has this got to do with Clara Patterson? That question will be addressed in Belfast, 125 years after Patterson’s long forgotten act of solidarity with the Islanders of the Torres Strait. 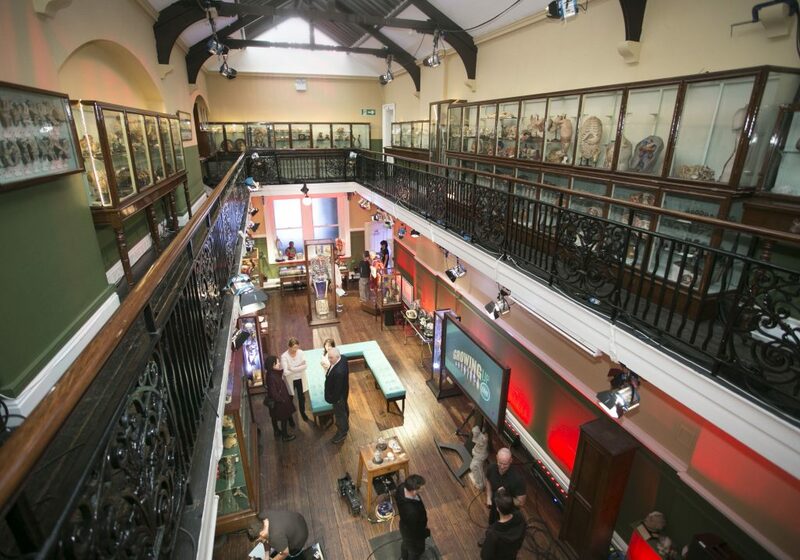 The Anatomy Museum is a really interesting setting for a show like this. Historically, dissections were done in front of a live audience. That won’t happen in “Growing Up, Live” but the audience will be surrounded by the results of 300 years of anatomical research. The Museum is home to a collection of anatomical and medical specimens that was built up over 300 years of medical education in Trinity College, University of Dublin, much of which was “re-discovered” when “Old” Anatomy Dept was decommissioned in 2014 and the School of Medicine move to the TBSI building on Pearse St. The live broadcast marks a turning point in the process of opening the least known and most interesting museum in Dublin to the public. In March 2017, Joe Duffy created some controversy when he called for the skeleton of Cornelius Magrath, the Irish Giant, to be removed from display in the mistaken belief the Magrath’s body had been robbed, dissected in secret, and his skeleton put on display in 1760. I was working on the collection at the time and found evidence that Magrath had in fact been in the care of Trinity School of Medicine when he died. The controversy died but there was a some nervousness about opening the collections to the public as a result. Brendan Holland, another Irish Giant, came to the rescue. He filmed part of the documentary “The Giant Gene” in the Anatomy Museum and went public on the most difficult question of all: as a giant, how would he feel it his skeleton was put on display? Brendan didn’t have a problem with that, given the contribution that historic specimens like Magrath continue to make to medical research into conditions like gigantism. 2018. 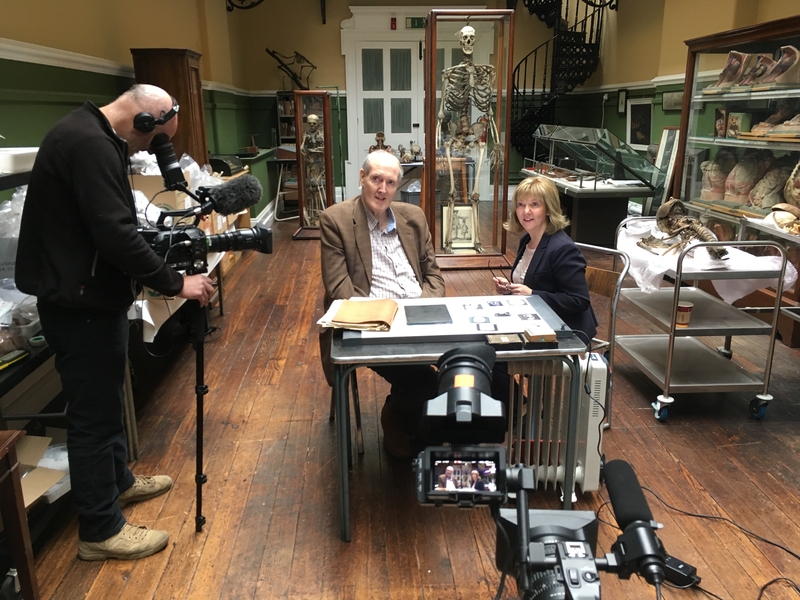 Public engagement at work: BBC Northern Ireland recording an interview between Brendan Holland and Martina Hennessy (School of Medicine TCD) for the a documentary entitled “The Giant Gene.” It was produced by Chris Nikkel and broadcast in June 2018. 2016. 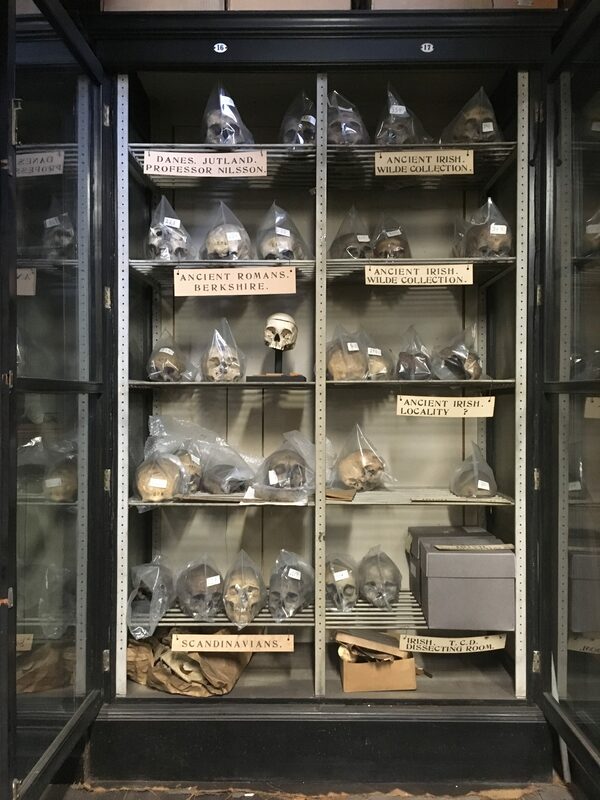 The Anatomy Museum operating as a mixture of conservation workshop and anthropological “field.” This is some of the material that was discovered in 2014 and needed to be sorted, catalogued, and stored in preparation for conservation and display. The anthropological material is visible in the foreground. The use of the space as a studio marks another turning point. An enormous amount of material was discovered in the process of decommissioning the “Old” Anatomy Dept in 2014. 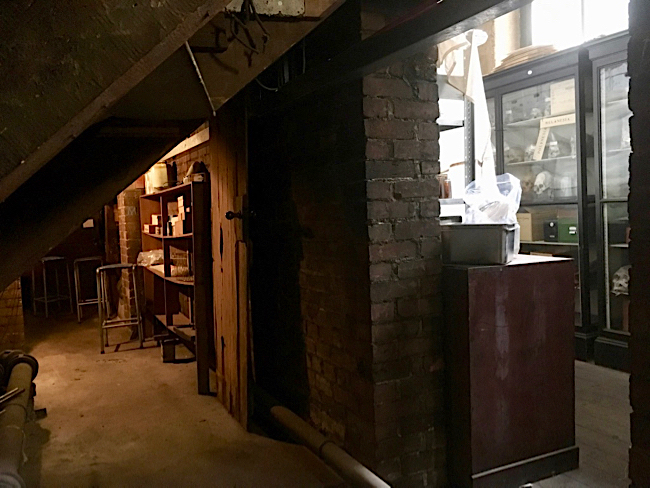 Much of this was in tea-chests and crates but there was a lot of material stored under the old theatre and in every nook and cranny of the building. This included a really important collection of photographs taken in the Aran Islands in 1890, shortly before the Anatomy Dept established a small Anthropology Dept and opened an anthropometric (the measurement of humans) laboratory. A photograph taken by Andrew F. Dixon and Alfred Cort Haddon in Dún Chonnchubhair, Inis Meáin, in 1890. The negative on the left still has the masking that was used to create the effect of a clear sky. The image on the right is an inverted scan of the original, which is called a positive. That is where curator.ie got involved. I received funding from the Irish Research Council (research.ie) to work on collections associated with the Anthropometric Laboratory and its programme of ethnographic surveys in the west of Ireland. The project was a joint venture of Maynooth University, TCD School of Medicine, and Kimmage Development Studies Centre, now Shanahan Research Centre. As a curator and a student of anthropology, I did my fieldwork in “Old” Anatomy. Most of the material discovered in 2014 was stored in the Anatomy Museum and it took the best part of two years to go through it and organise suitable storage in the nooks and crannies from whence it came. The plan, all along, was to restore the museum as a public space. The filming of “The Giant Gene” was a key part of a strategy to make the collection visible and to engage the public in a conversation about the contemporary significance of “Old” Anatomy, whether that is the Skeleton of Magrath, the huge range of medical education material, or the ethnographic material associated with the Anthropological Dept. 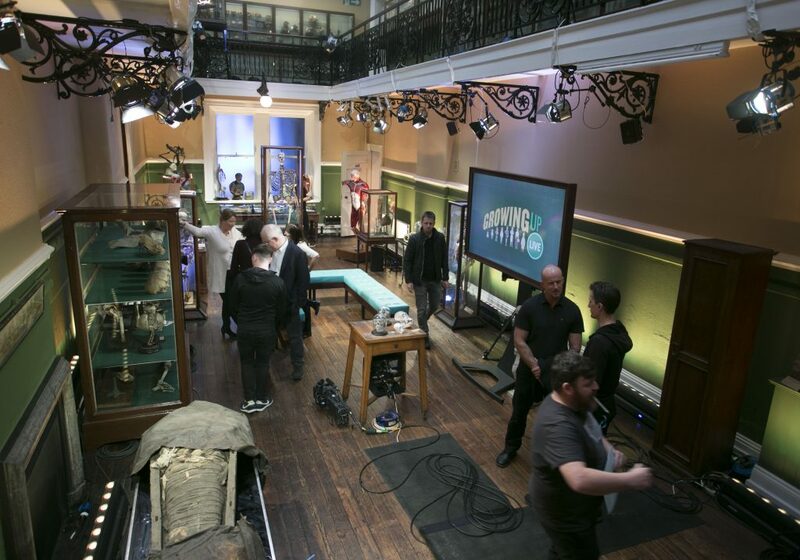 The filming of “Growing Up, Live” is on a different scale altogether, given the reach of Science Week and the presence in the museum of a studio audience. 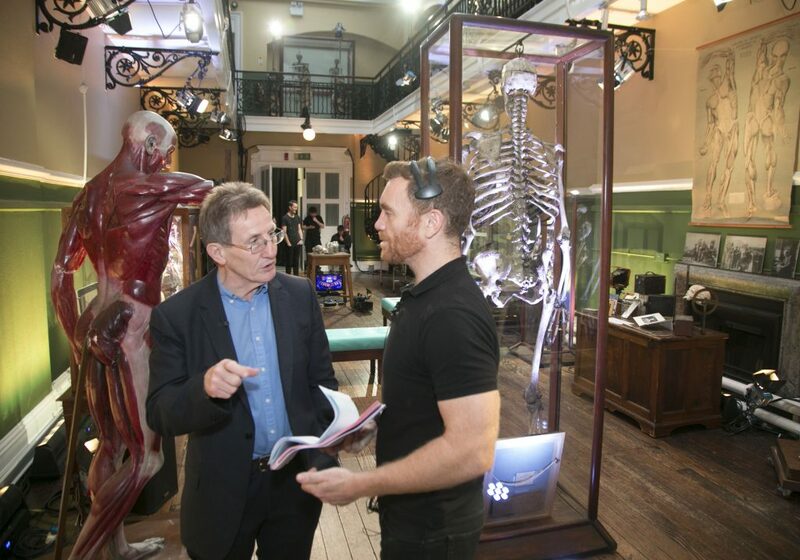 RTE publicists have described the “studio” as an amazing Anatomy Museum” and it will be very interesting to see how the audience engages with the various collections. This is the space to watch during Science Week. The history of the British Isles as represented in skulls. Ethnologists in the mid-nineteenth century believed that they could find traces of the various invasions of Ireland by comparing the shape of ancient skulls. To Follow: The Skull Measuring Business: the work of the Dublin Anthropometric Anthropometric Laboratory (1891-1903). Four years ago, I was given the job of finding out what exactly was going on in the Dublin Anthropometric Laboratory, which was established in TCD in 1891. 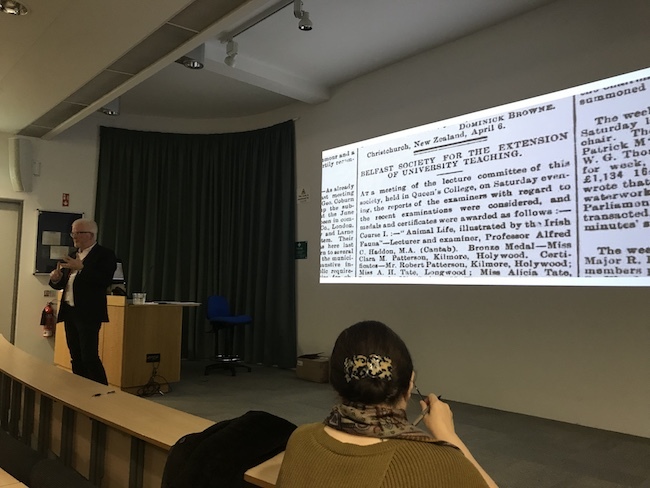 My research has focussed on the Laboratory’s programme of ethnographic surveys in the west of Ireland, which were conducted by “head-hunters” Alfred Cort Haddon and Charles R. Browne between 1892 and 1900. 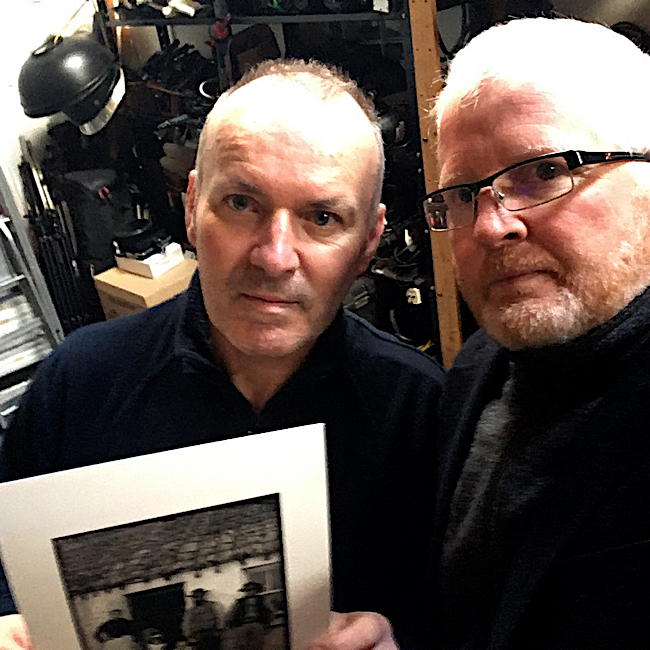 The main question is this: what do the surveys tell us about the development of (1) social documentary photography in Ireland and (2) a western imaginary based on island life in the west of Ireland? 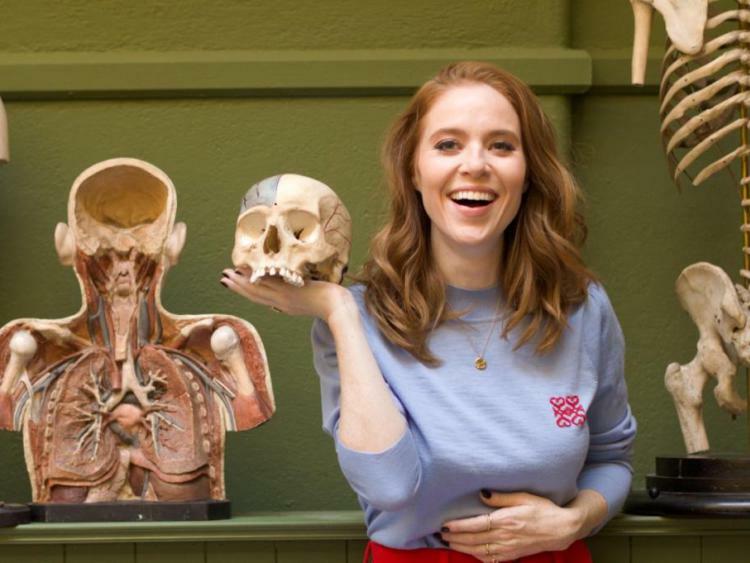 My research also considers the ethical and practical implications of placing material from the laboratory–including anatomical specimens–into the public domain, especially in the context of debates about the relation between body, image, and identity in contemporary Ireland. Four years on the project is entering its final phase. The tricky task of converting extensive work on primary sources in Dublin and Cambridge is well underway and slowly taking shape as a text. 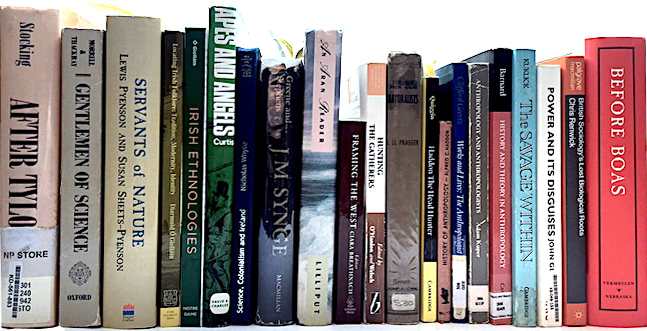 This text is structured around the idea of murderous, little facts from the hidden spaces of anthropology in Ireland. These facts have produced some interesting results; not least the need for some radical new thinking about the history of anthropology as a whole. Ugly Little Facts: Aidan Baker, Librarian of the Haddon Library in Cambridge, with a collection of papers relating to the Aran Islands. 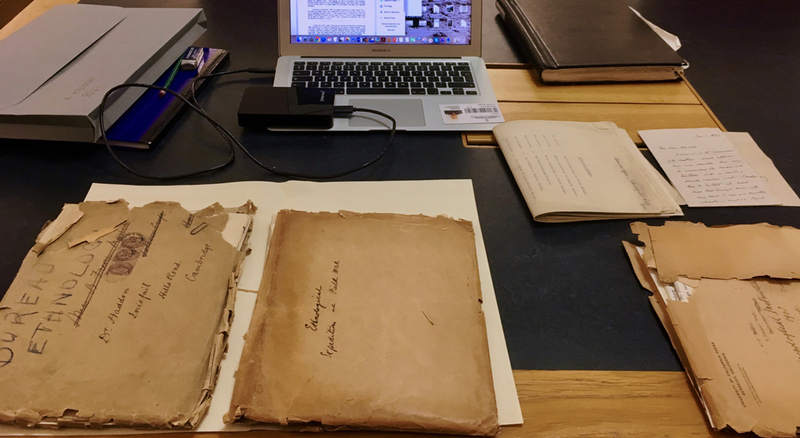 The documents were placed in an envelope in 1913 and “lost.” They were rediscovered in 2013 in a search for Haddon’s notes and/or other papers relating to “The Ethnography of the Aran Islands, County Galway” (Haddon & Browne 1893). My theory–or historiographical framework perhaps–is that the disciplinary history of anthropology operates around a foundational trope. Haddon is represented as taking anthropology out of the armchair and into the field in 1898; after he had escaped from the Darwinian backwater that was Dublin in the 1890s. That claim is not supported by facts in the Haddon papers and related sources but, repeated often enough, it has become a form of disciplinary folklore that has compressed the history of anthropology and circumscribed narratives like that of the Dublin Anthropometric Laboratory. 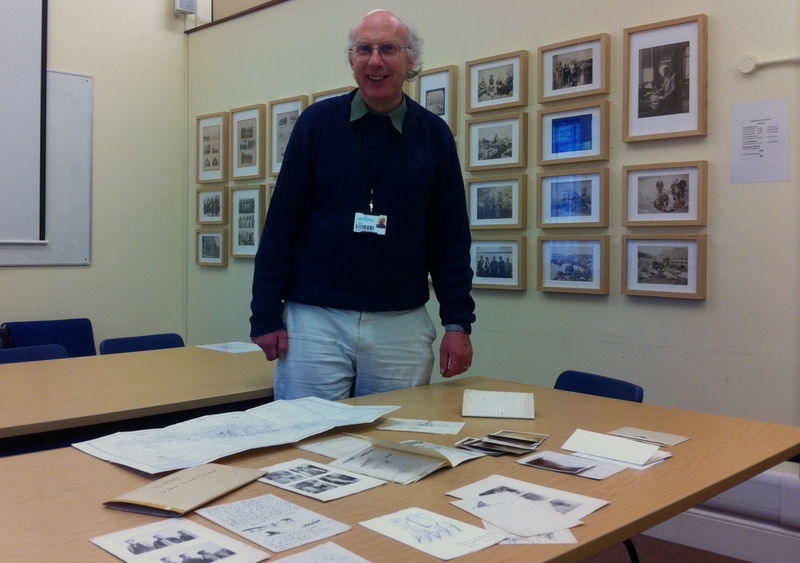 Reading Haddon: A small section of the Haddon Papers in Cambridge University Library. The strategy I have adopted in response is to use overlooked primary sources as “tropocidal” facts; using ugly, little facts gleaned from the forgotten spaces of anthropology to kill off the armchair trope and suggest some alternative narratives. The Dublin Anthropometric Laboratory, in this scenario, becomes (1) the site of a struggle for disciplinary authority between conservative (biological) and radical (sociological) elements within “organised” anthropology in the 1890s, (2) an agent of the development of an equally radical, photo-ethnographic practice in fieldwork associated with the Laboratory and (3) the starting point for John Millington Synge’s exploration of peasant life in the West of Ireland. Photography as ethnography: a photograph taken by Browne on the Great Blasket Island in 1897. 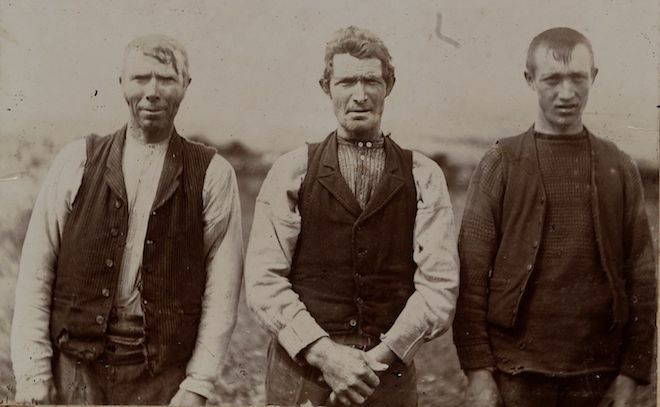 The man in the middle is Tomás Ó Criomhtain, An tOileánach, one of the most celebrated figures of the Blasket Island Community and an important figure in folklore studies in Ireland. Photograph courtesy of the Board of TCD. This study is grounded in the discovery of artefacts, records, and photographs associated with the Dublin Anthropometric Laboratory, which prompted a new reading of Haddon’s association with it. In 2014 Siobhán Ward of TCD started unpacking tea chests containing a substantial collection of historical material from the School of Anatomy. 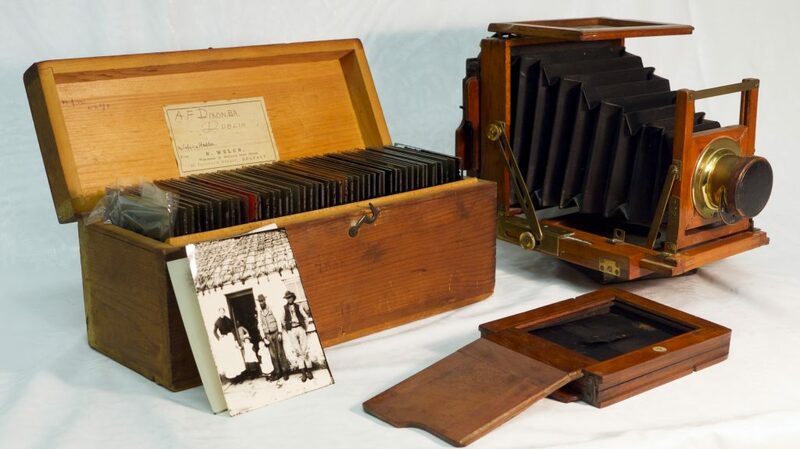 This material included specimens, instruments, records, paper and a spectacular collection of glass plate negatives dating from 1890. This material had ‘disappeared’ in 1948 when it was placed in long-term storage under the theatre in the “Old” Anatomy Building. Reconstruction of the anthropological collection began in February 2016 and the contents of the tea chests have since been recorded, sorted, and tallied with related material in other collections in Ireland and UK. It wasn’t long before a gap opened up between the conventional history of pre-modern anthropology in Ireland and the ugly little facts —documentary and material— that had emerged from “Old” Anatomy. “Unpacking” the Dublin Anthropometric Laboratory in 2016. An early photograph showing the anatomical and anthropological material discovered in the “Old” Anatomy building in 2014. 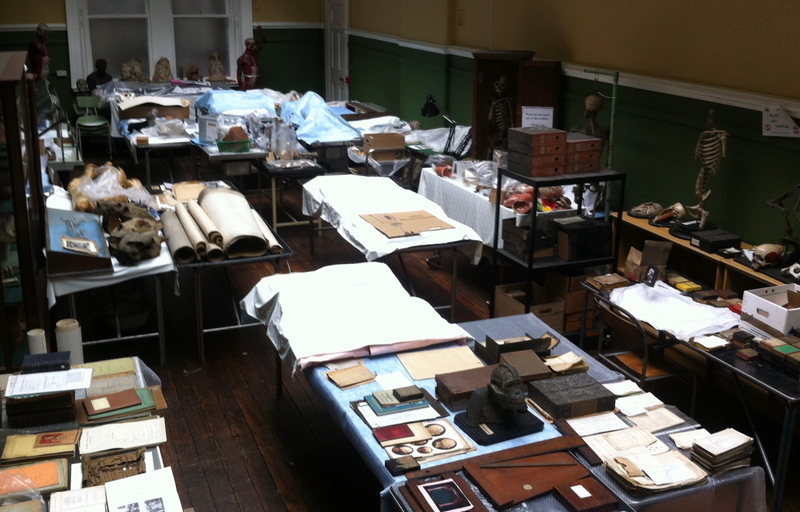 The records of the Laboratory and associated artefacts are visible in the foreground. They include the schedules of measurements taken in the Aran Islands in 1892, Daniel J. Cunningham’s cast of the cranial topography of a chimpanzee, and some of the psychometric instruments designed by Francis Galton. “Unpacking” the Laboratory has become, unexpectedly, a confrontation with the historiography of anthropology. This has meant spending just over two years reading what Haddon wrote – rather than reading about what Haddon was thought to have done – and this has produced some interesting new narratives. This part of the project will conclude in 2019 … hopefully. A man of Vision: Fr Bartholomew Cavanagh ( 1821-1897), Parish Priest of Knock and Aughamore in 1879. This is man who may have engineered an apparition using a magic lantern. The site of the “apparition” is visible in the background. Photo: Knock Shrine. 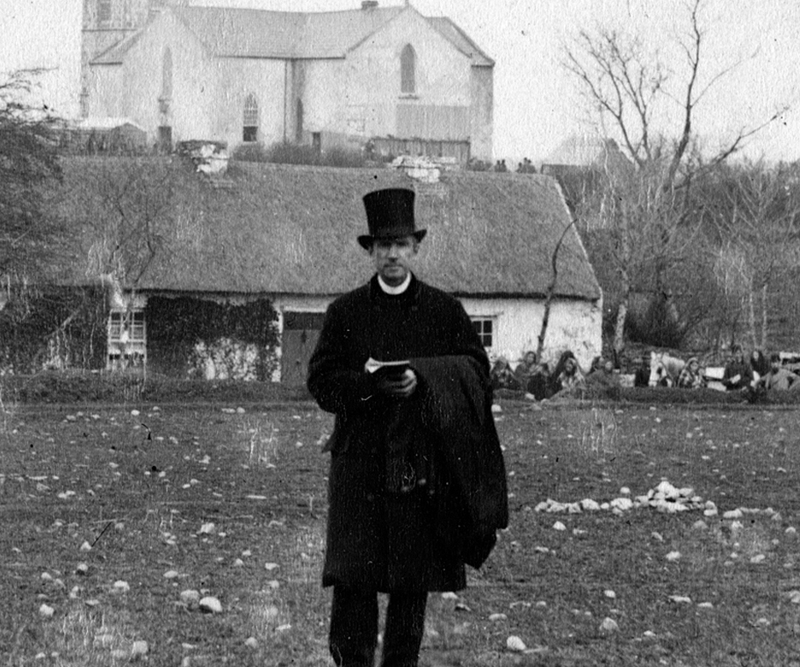 The latest post on the curator.ie blog examines new evidence supporting the claim that the apparition said to have occurred in Knock in 1879 was in fact a slide show engineered by the parish priest (pictured above). 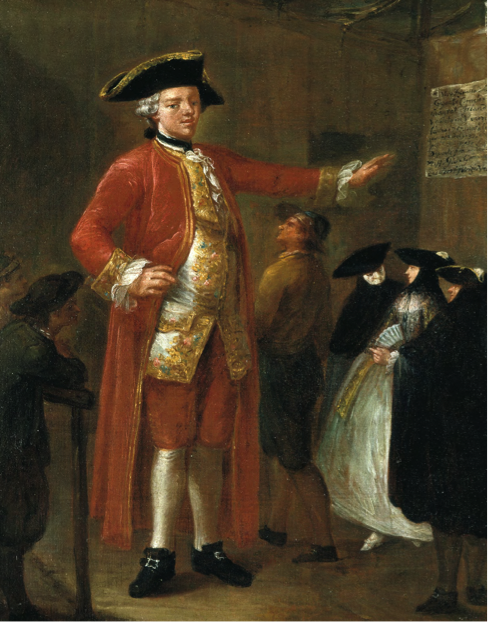 It builds on research into the Dublin Anthropometric Laboratory, drawing on an investigation of the role played by James Hack Tuke in the organisation of a survey of fishing Grounds in the West of Ireland in 1890. This survey laid the foundation for the programme of ethnographic fieldwork undertaken by the Laboratory in one of Tuke’s main areas of operation, Mayo and Connemara. 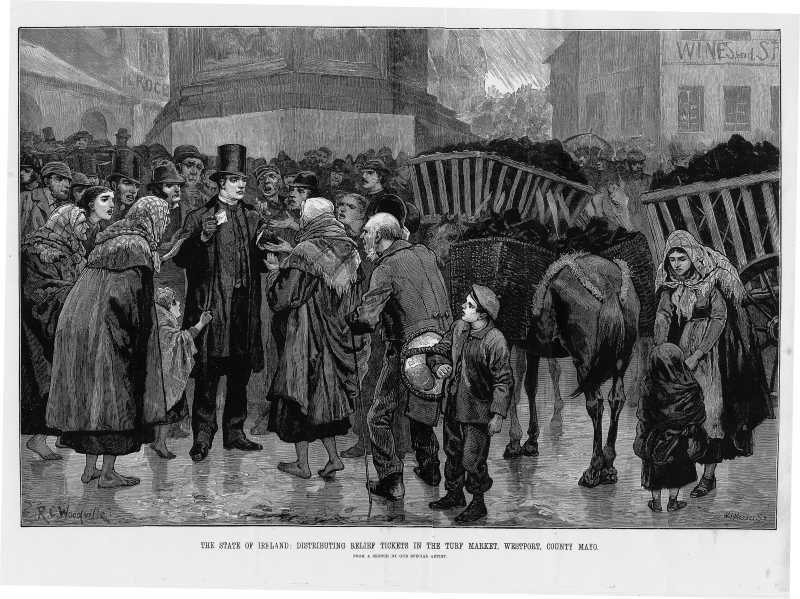 Sketch showing distribution of relief tickets in the turf market in Westport. 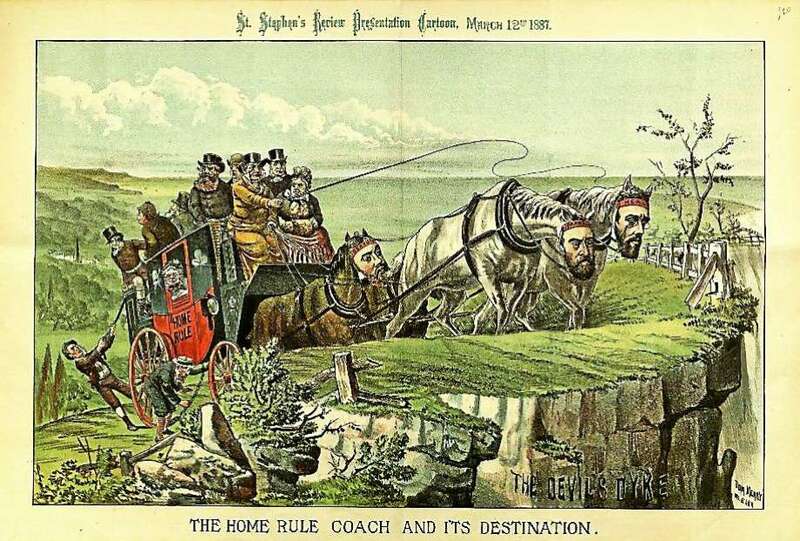 From Illustrated London News, March 6th, 1880. Source Mayo Library. Tuke visited Knock in 1880, 6 months after the apparition occurred and 6 weeks or so after the first report was published in the press. Tuke claimed that the “apparition” involved the use of a lantern projector to “depict” the Blessed Virgin as in a “vision.” This connected with a conversation I had some time ago with Stan Mason, grandson of Thomas Mason, the man who recalled providing the parish priest in Knock with a lantern projector around the time of the apparition. It seemed obvious to me that Knock was more slide show than apparition. The announcement that the Pope was going to Knock as part of his visit to Ireland (2018) prompted a review of the literature on the apparition of 1879. The findings are posted on Ballymaclinton, which is sort of appropriate given that the blog was inspired by a fictional village that was created as a showcase for the “Real” Irish during the Franco-Brititish exhibition in London in 1908. The most surprising finding is that church authorities were sceptical of reports of an apparition and commissioned Francis Lennon, Professor of Mathematics and Natural Law in Maynooth, to investigate the possibility that a lantern projector was used. He concluded that the “apparition”was created using some form of optical device but he was overruled. John MacHale, Archbishop of Tuam, decided that the witness statements were trustworthy and set about establishing Knock as a site of Marian apparition and pilgrimage. The story was published in the Tuam News in January 1880. 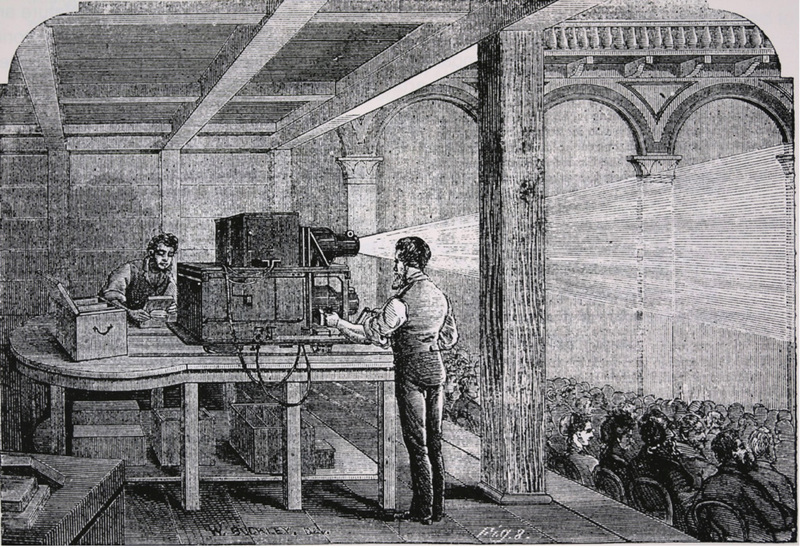 A lantern projector in action. Source: Martyn Jolly. So, the question has to be asked: If the apparition was a slide show, as the evidence suggests, why is Pope Francis visiting Knock? Maybe it is a case of history repeating itself and maybe it is a case of the optics of pilgrimage. For more go to Ballymaclinton. The Skeleton of the Irish Giant, Cornelius Magrath. Comments Off on The Skeleton of the Irish Giant, Cornelius Magrath. The Skeleton of The Irish Giant, Cornelius Magrath is held by the School of Anatomy in Dublin University, Trinity College (TCD). It is the most famous item in a historic collection of anatomy specimens, records, and instruments that is held in the ‘Old’ Anatomy Building. The building was decommissioned in 2014 and the collection is being resolved as part of post-grad research programme managed jointly by the School of Medicine TCD, Maynooth University, Kimmage Development Studies Centre, and funded by the Irish Research Council (IRC). The skeleton is “in the news” following calls for Magrath’s remains to be buried. The controversy kicked off on the History Show on RTE Radio 1. It was picked up by chat show host Joe Duffy on Monday. Duffy argued that TCD should bury the skeleton of Cornelius Magrath because it was taken in a ‘body snatching’ raid on Magrath’s wake. Since then a debate of sorts has been taking place on the show. The problem here is that there is no evidence that the body snatching story, however entertaining, is true. Magrath died on 16th May 1760 but the only contemporary account of his death was most likely written by either Robert Robinson, Professor of Anatomy in TCD, or Dr. George Cleghorn, the University anatomist. It is a rather enigmatic account, stating only that “Upon death, his body was carried to the Dissecting House.” (see Daniel J. Cunningham’s 1891 report to the Royal Irish Academy). Magrath was dying of a wasting disease and it is clear from the Robinson/Cleghorn account that he was receiving medical attention at the time of his death. It records that Magrath’s “complexion was miserably pale and sallow; his pulses very quick at times for a man of his extraordinary height; and his legs were swollen.” Elsewhere, it states that his pulse beat almost sixty times a minutes “on his arrival here.” It sounds like Magrath was being cared for in the School of Medicine TCD when he died. 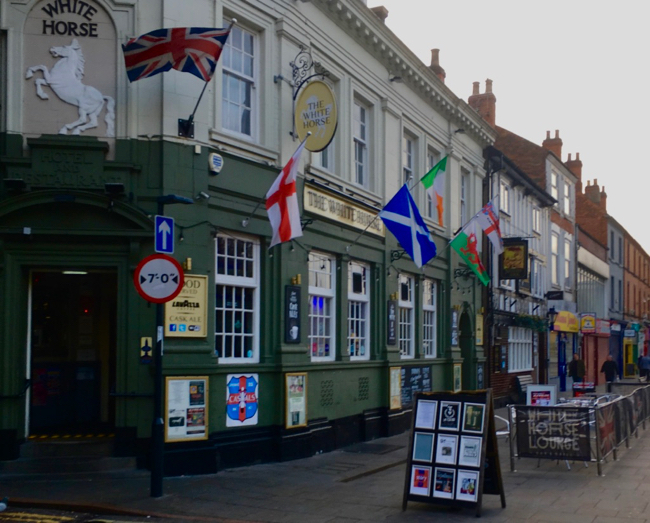 The body snatching legend has it that Magrath was being waked when medical students spiked the porter and made off with his body, which was immediately dissected in secret. Such a sensational body snatching could not have escaped notice and, furthermore, the dissection was both public knowledge and uncontroversial. Historians of anatomy in TCD have always believed that the body was paid for by Cleghorn and that the acquisition of the body was legitimate and ethical by the standards of the day. The problem here is that there is no documentary evidence of Magrath having consented to dissection or the permanent display of his skeleton. That brings us to the contemporary issue of retention or burial. The report of the Working Group on Human Remains in Museum Collections (WGHR), published in the UK in 2003, acknowledged that human remains in collections “represent a unique and irreplaceable resource for the legitimate pursuance of scientific and other research” (p. 28) and concludes: “The Working Group feels that there is much merit in including museum collections of human remains within the regulatory structure proposed by the DH for health authorities and hospitals.” (p. 81). 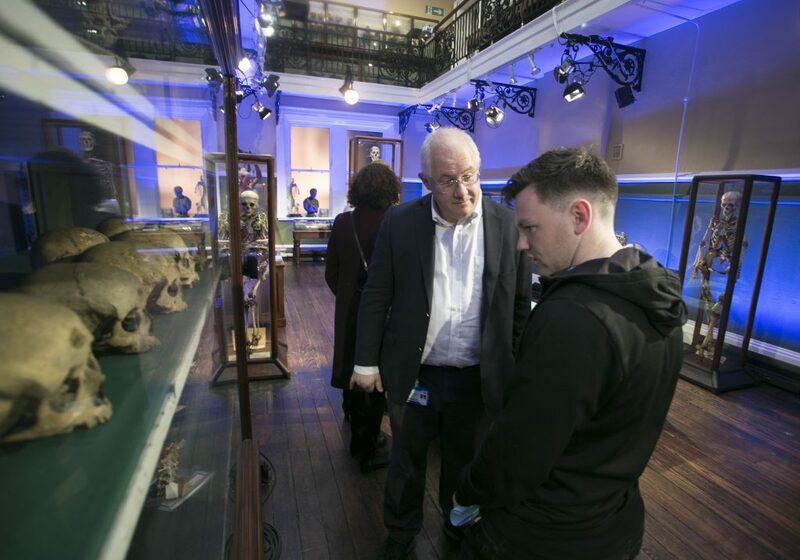 Supervision by the Inspector of Anatomy of the ‘Old’ Anatomy collections in TCD covers the issue of regulation in Ireland in terms of the retention of Magrath’s skeleton as part of a historical scientific collection. This leaves the burial of Magrath’s remains at the discretion of the college authorities; which means that any decision will have to deal with public perception as to the “morality” of retaining identifiable human remains in collections of scientific material. That is deeply problematic, and Duffy’s attempt to frame the issue in body snatching folklore is distorting what should be a valuable and timely debate.